Casio has announced a twisty new camera as part of its Exilim digital camera range. The Tryx EX-TR100 has a rotatable frame for experimenting with different camera angles and hard-to-frame shots. Teenagers and internet posers will no doubt be delighted with the ease at which they can take arms-length self portraits thanks to the new design. 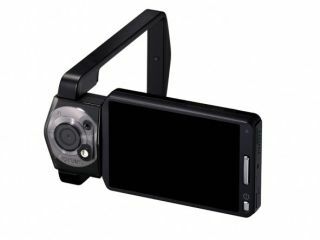 With a 3-inch LCD screen with rotating touch panel, users will have excellent control over what's in shot and what effects to apply to the image. The lens is a single-focus 21mm wide-angle affair, but the Tryx is capable of recording HD video as well as slow-motion movies and offers a 12.1-megapixel, back-illuminated CMOS sensor. Casio also announced a ream of other Exilim models, including the EX-H30 which purports to take 1,000 photos on a single charge, and the EX-ZR100 which offers a high-power zoom lens with 12.5x optical zoom. No word yet on UK pricing or release date of the Tryx; those spectacular angles will just have to wait.